4. Dea­ling with care profes­sio­nals http://www.ca­reinfos­cot­land.scot/topics/where-to-start/dea­ling-with-care-profes­sio­nal..
6. As­sessment of your care needs http://www.ca­reinfos­cot­land.scot/topics/how-to-get-care-ser­vi­ces/as­sessment-of-your-c..
9. Natio­nal Eligibi­lity Crite­ria http://www.ca­reinfos­cot­land.scot/topics/how-to-get-care-ser­vi­ces/natio­nal-eligibi­lity..
10. Co­ming out of hos­pital http://www.ca­reinfos­cot­land.scot/topics/how-to-get-care-ser­vi­ces/coming-out-of-hospit..
two profiles were found for Careinfoscotland.co.uk in social networks. Among other social networks the website is represented in Facebook and Twitter. The web server used by Careinfoscotland.co.uk is located in Gloucester, Great Britain and is run by Fasthosts Internet Limited - UK's largest web host. This web server runs 2 other websites, their language is mostly english. 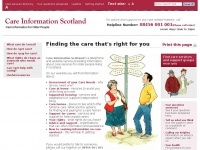 The Careinfoscotland.co.uk websites were developed using the programming language ASP.NET and served by a Microsoft-IIS server. The website uses the latest markup standard HTML 5. The website does not specify details about the inclusion of its content in search engines. For this reason the content will be included by search engines.